Revealed alongside the Galaxy Note 9 earlier this month, the Samsung Galaxy Watch LTE is now available for pre-order. Priced at US$379.99 (42 mm in Rose Gold or Midnight Black) and US$399.99 (Silver), this smartwatch is designed for T-Mobile and will begin shipping in the first week of September. If you were looking for a worthy smart wearable companion for the Galaxy Note 9, you will be happy to find out that the LTE-enabled Samsung Galaxy Watch is now up for pre-order. 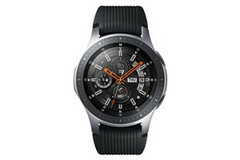 However, this smartwatch comes with a catch and some will not be able to swallow it: there is no variant for Verizon Wireless, Sprint, or AT&T, because the LTE Galaxy Watch has been designed with T-Mobile in mind. Those interested can pre-order the 46 mm Galaxy Watch in Silver for US$399.99, but those who can live with the smaller 42 mm variant can choose between the Rose Gold model and the one that comes in Midnight Black. Both 42 mm Galaxy Watch models have the same price tag of US$379.99. In the future, other carriers will probably offer their own Galaxy Watch LTE variants as well. For now, it is just the T-Mobile way or no way.